A land that will surprise, delight and fill you with enthusiasm. Versilia, a location that evokes treasures of culture and tradition, jealously conserved. Close your eyes and imagine a place in which you, your partner or family can feel relaxed and pampered in a welcoming and familiar ambience. 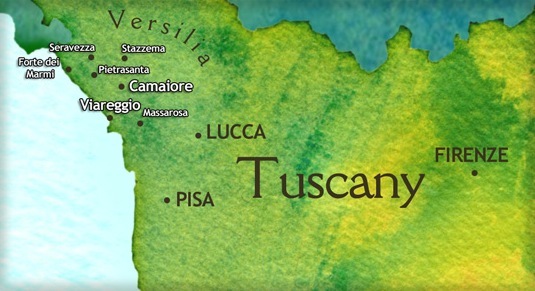 Situated in the North western corner of Tuscany, within the province of Lucca, the Versilia has always been a tourist destination for excellence, known and appreciated worldwide for its multiple points of interest. Foremost it’s golden beaches which frame perfectly lazy days under the sun and long walks along the shore with the marvelous backdrop of the Apuan Alps, that offer a fascinating mountain environment for those who desire trekking excursions of various levels. All of these diversities are then found in the local cuisine, as a large part of the territory is agricultural, many original production processes have been maintained, therefore many food products distinguish themselves in quality and tradition, the wine produced on the Monti di Ripa hillside, local extra virgin oil from olives still handpicked, various seasoned salamis and hams and honey are produced in the higher planes of Versilia and are a few examples of award winning slow foods that are served in local Trattorias and you can certainly taste the difference. Pietrasanta, pretty medieval town where it is possible to meet local artists and sculptors who will explain how turning marble and bronze into pieces of art is not only a firm vocation but has become their refuge in life. Then enjoy the beautiful square watching the world pass by from one of the cafès. Viareggio, famous for its Carnival, again the floats are fruits of the very knowledgeable work of local artisans. It’s easy to while away a few hours on its famous promenade dotted with some rare examples of Liberty Style architecture. Lots of entertainment on hand, Caffès, bars, discotheques, restaurants, but also art exhibitions, cultural events and open air concerts which are held in the various squares as well as the Versiliana Park.A vast choice of sport is found on hand with trekking, golf, horse riding, surf and canoeing are available to those wishing to practice these and other types of sport. The easily accessed Five lands in Liguria, the Marble caves in Carrara, the cities of art Lucca, Florence and Pisa are all easily reached on public transport and excursions possible within a day trip.